Shrink wrap products with ease! 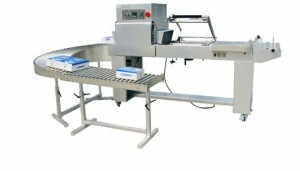 A shrink wrap machine is a necessity for any company that packages their finished materials. However, many people, especially those using a shrink wrap machine for the first time, have a few questions about it. Here are a few Frequently Asked Questions to help you get to know your shrink wrap machine! Why Use a Shrink Wrap Machine? Before you make the decision to purchase a shrink wrap machine, you want to know that the purchase will be worth it! Shrink wrap is a great way of protecting brand new materials during shipping. The plastic is delicate enough to shape itself to the exact contours of your product yet strong enough to weather the journey from your company to the end user. Wrapping your products in shrink wrap secures every page in place and provides a protective barrier against moisture and dirt. When your products arrive to your clients looking brand new, it also makes your company look great as well! Can the Heat Tool Cause Damage? The beautiful thing about shrink wrap is that the plastic is more reactive to the heat than anything you will be shrink wrapping. The amount of heat applied to the plastic will make the plastic shrink to fit your product. If there is too much heat, the plastic will buckle and break well before the heat reaches a level high enough to damage your product. Just throw away the broken plastic and try again! Is a Shrink Wrap Machine Difficult to Use? Luckily, shrink wrap machines are as simple as making one motion to seal the plastic and a second motion to shrink the plastic. Shrink wrap machines are so simple and handy to use! How Long Will a Shrink Wrap Machine Last? Most shrink wrap machines tend to work well for decades! Because the machine does not utilize any complicated processes or become easily overexerted, you’re likely to be using your shrink wrap machine for years to come! This entry was posted on Friday, March 4th, 2016	at 12:06 pm	and is filed under New printing equipment	. You can follow any responses to this entry through the RSS 2.0	feed. Both comments and pings are currently closed.